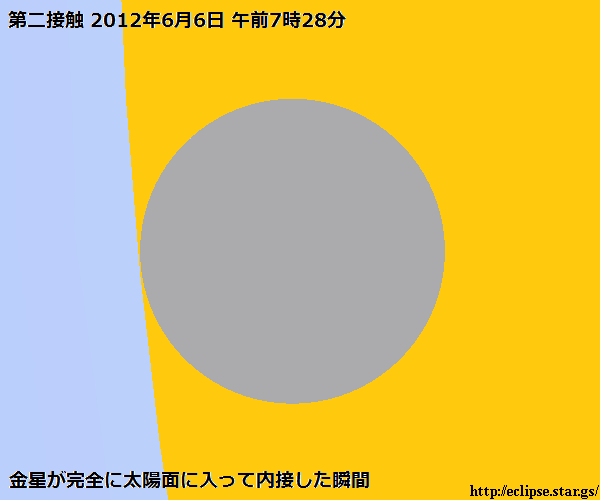 §Japan is seen in the transit of Venus across the sun on June 06 2012. Earth seen from Earth when Venus aligned with the sun, Venus can be seen how the move to the front of the sun. This phenomenon is a phenomenon in eight years since 2004, not seen until 11 December 2117 and miss it. Some people say that passing this phenomenon has been recognized both at the moment. Incidentally, public networks astronomy, has adopted a transit of Venus across the sun and the words say. §The transit of Venus across the sun, or when what is seen? In case the inner planets (Mercury and Venus) is a term used only in astronomy. If called in case of planet Earth, in order of the sun, called the superior conjunction, in order if the sun planet Earth. Superior conjunction of the planets except No. (sold us) is called. Venus is inclined to the ecliptic plane of the Earth at 3.395. There are 7.005 degrees inclination to the ecliptic plane case of Mercury. Since the sun passes through the upper or lower case and also in order, and is usually not seen the sun to pass through. This is the same reason every new moon eclipse will occur. The case is the synodic period, Mercury Venus is 115.9 days 584.0 days. The ascending node crossing from south to north passing through the Earth's ecliptic plane in the planet or moon is called the descending node passes through the intersection from north to south. If Venus is passing through the ascending node in early December each year, passing descending node is the beginning of June each year. At that time, the sun can be seen passing from the earth in case it becomes Venus. The right figure is a schematic diagram of the moving path of Venus. Venus will transit the sun from west to east. The transit of Venus will occur four times per year at a rate of 243, the route has moved gradually down to the south. On 14 December, 2854 AD, will open the next time interval between the transit of Venus across the sun flying behavior. There is a similar cycle of Saros to the transit of Venus across the sun eclipse, the period of 4 is no longer seen in the last transit of Venus in December 2611 to 13 AD. 3 period, you will not see the transit of Venus on June 22, 3462 end date. A similar life cycle seen in the transit of Venus across the sun, the earth was first seen on November 20, 1763 BC, a period of 4 as an example. As the sun to the south side of this period ends on 13 December 2611 last year. Since then Venus is passing through a similar path, orbit the sun passes through the cycle it will disappear from the outside. Looking closely at the picture of this route, you know the approximate time Venus passes through the solar surface. November 23, AD 424 passing through the center point of the sun, especially 19:17 to 19:01 welcomed the first contact of the world celebrated the second contact time. Up to 23:05 ... contact welcome to contact the third pass through the center point 2:54 into the sun That ends the fourth contact in 3:10. As seen in Japan is all but over, I observed no such age would not even dimming filter. During this period of approximately eight hours, the sun would pass through the surface of Venus. December 13, 2611 four year period and the opposite end, the 13:07 to 12:04 welcomed the first contact of the world will mark the second contact time. The maximum contact ... welcome to 13:34 14:01 to contact a third sun passes through the center point on the path that is, 15:04 and ends on the fourth contact. First contact and second contact, but as long as one hour of the third contact and fourth contact, which appears to pass through it diagonally across the edge of a Venus passes near the edge of the sun longer contact time with the sun from. This time only about three hours, you should not pass through the solar surface of Venus. To simulate the passage of Venus on 13 December, AD 2611, in Lima Peru north passes through the solar surface in contact with the rim of the sun while Venus. Unfortunately for the night in Japan, this phenomenon can not be confirmed. In Cape Town, South Africa is a phenomenon in the afternoon. In the east of Pretoria, will celebrate the sunset before the end of the transit of Venus across the sun. Name of the cycle is used in the way transit of Venus across the sun, such as proper names used in the Saros eclipse is not. If I'm forced to say, what will the Transit Series 4? 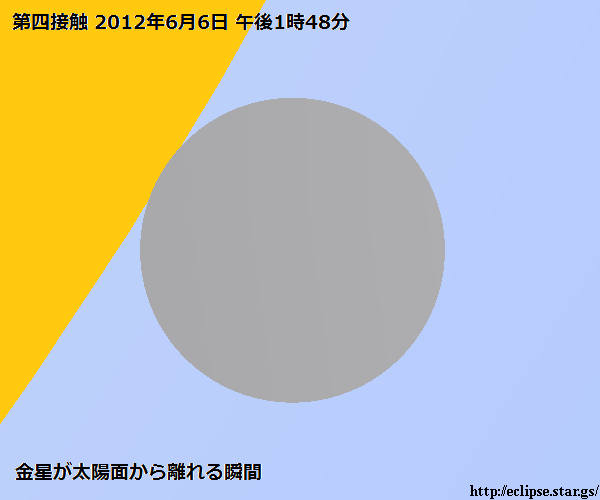 Transit of Venus usually occur in pairs eight years apart on the day. This is the same for almost 13 years as the length of the length of the eight-year Venus Earth, Venus and the Earth every eight years so get in the same position. This proximity to the sun causes the passage in pairs but sufficient to cause the sun to pass through three successive times is not enough. For example, on June 6, 2012 June 8, 2004 transit of Venus happens. 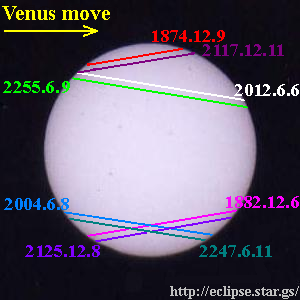 However, on June 3, 2020 after nearly eight years that is about 50 minutes when 18 (UTC) of about 0.5 degrees in the center of the sun, Venus (similar to the sun's apparent diameter) only approach the end, transit the sun does not occur. Happened in the last passage for the sun occurred in 1153. Years 2733 and 2741 years have come in pairs, the year 2846 will not occur in pairs so slightly away from the surface of Venus solar cycle 4. The year 2611, Venus will be just outside the sun as seen from the center of the Earth as seen from the southern part of the sun to pass through only a part (north of Lima in Peru, the rim of the sun Venus While passing through the solar surface in contact with.) Simulation year 2854 was, to see the transit of Venus across the sun on the earth are away at the edges of the Antarctic sun is not tight. §In the year 2012,it look like? 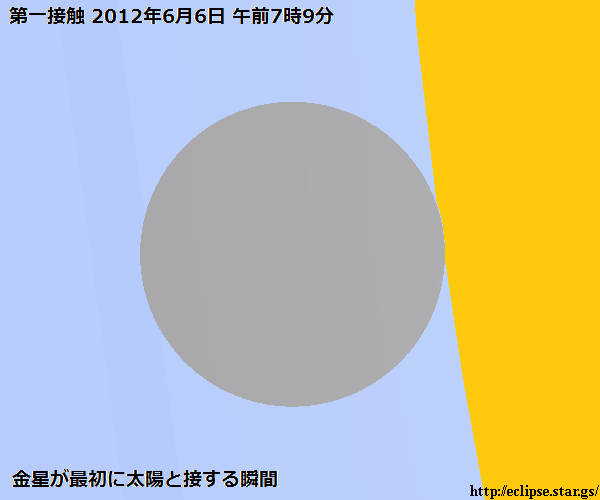 June 06, 2012 by the table above (Japan time) occurs in the transit of Venus across the sun. First contact at first contact with the surface of Venus the sun, a moment of second contact surface of the sun completely inscribed into Venus, the third moment of contact out of the plane just before the sun inscribed Venus Venus We call it a moment away from the fourth contact the solar surface. This designation is defined similarly to the eclipse. Japan is seen in all over the country. 1559 view of the solar radius "radius of the moon seen in 1532 64" 58. In addition, the visual radius of Venus 30 "radius of Mercury seen in 16 5" 49. These are all visual radius of the Earth as seen from the average. Venus in diameter and 100 to fix, "the sun in 3200 32" is 8, Venus is said to be as big as 100 / 3 from the sun. It is also apparent from the size of Jupiter, Venus is so superior, and far more spectacular phenomenon of the sun passes through the planet's only about one-sixth the size of Venus. 3.125% and that serving the eclipse. The serving size is calculated as 0.52 percent of the eclipse in the case of Mercury the way. Numbers were calculated proportionally. 12104km on the actual size of the diameter of Venus, Mercury's diameter is 4880km. Is a little confusing, is a story about the planet's apparent size as seen from Earth only. To infiltrate does not appear clearly as shown is not Venus. Venus is seen as a sudden infiltration of some kind there is nothing you have not. After infiltration, and say that the climax transit of Venus across the sun until completely inscribed with the sun.Please take the picture to miss this moment. Every day before the advent of true climax. Passage of the sun in Japan since the last progress is still celebrated sunset, unless you're on overseas expedition who did not transit of Venus across the sun on June 8, 2004, the sight of the first appearance of Venus show You will be overwhelmed. After appearance is seen as Venus to disappear does not exist at anything. The phenomenon of valuable good will to commemorate those who later on what I've always recorded. Transit of Venus across the sun will continue for about 6 hours and 40 minutes. Shooting will continue to need a hell of a time. So summer, we also note sunburn. Most main I think the moment you emerge from the surface of the sun and the sun still sneaks into the moment. I take it both fun and take a moment to shoot expansion. Time to infiltrate altitude is about 30 degrees so the morning sun, the sun rises to nearly 70 degrees and altitude will also be in contact with up to 10.30. Altitude is about 60 degrees off the sun time to appear. Therefore, it is so good that I observed in the wide sky parks. If Japan sunny everywhere, you see all over the solar surface through the infiltration of Venus to appear. Transit of Venus is looking no different from the sun itself. 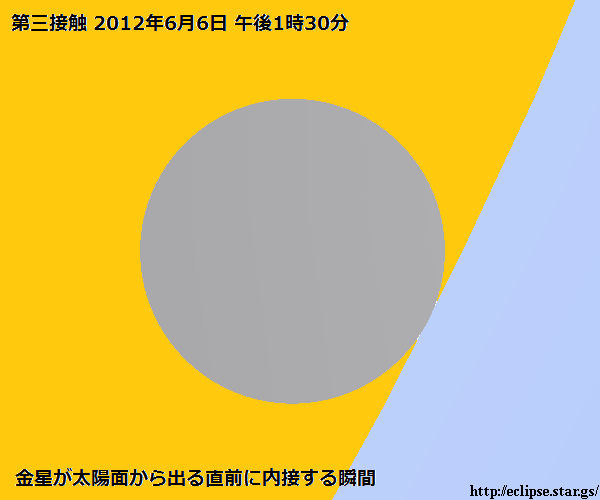 On May 21, 2012, annular eclipse can be seen in the Pacific Ocean belt. In the way we observe the sun, please observe in neutral density filter.